The Dwight D. Eisenhower Carrier Strike Group returned home today from a dramatic seven-month deployment to the Mediterranean Sea and Middle East. 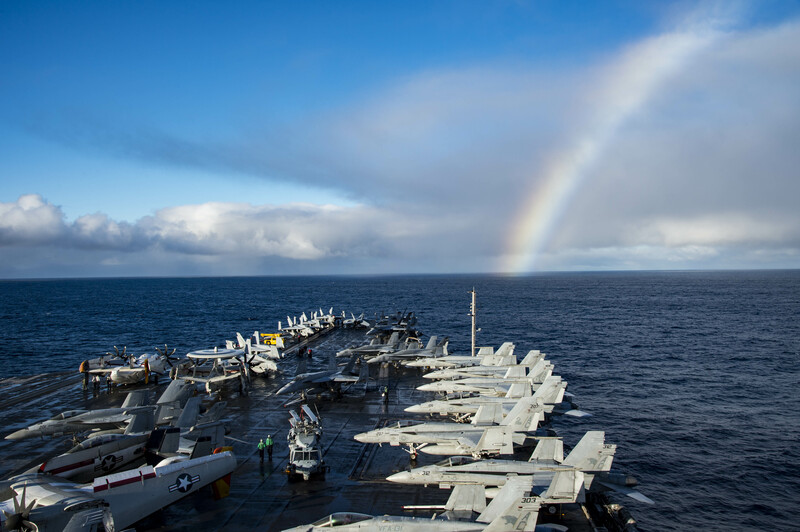 USS Dwight D. Eisenhower (CVN-69), guided-missile cruiser USS San Jacinto (CG-56) and guided-missile destroyers USS Mason (DDG-87), USS Nitze (DDG-94) and USS Roosevelt (DDG-80) faced threats from Russian and Iranian naval forces and Iranian-backed forces in Yemen, as well as demonstrated the Navy’s Great Green Fleet capability with the Italian Navy’s Flotta Verde. First, in June, a Russian frigate harassed the strike group in the Mediterranean, with the Russian Navy frigate Yaroslav Mudry (FF-777) making erratic movements and radio transmissions around San Jacinto. The frigate came within 150 yards of the cruiser and weaved through the water in San Jacinto’s wake, warning the American ship to “not cross my bow.” About two weeks beforehand, the same Russian frigate harassed a destroyer in the Harry S. Turman CSG. In August Nitze was harassed by Iranian naval forces while operating near the Strait of Hormuz. Four Iranian Revolutionary Guard Corps Navy high-speed patrol boats came at the ship, getting as close as 300 yards, without responding to hails or warning flares fired from Nitze, USNI News reported. 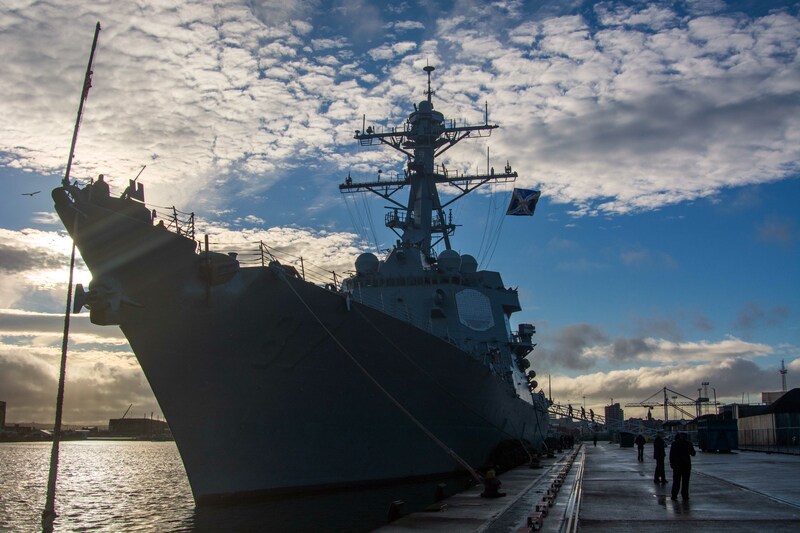 The guided-missile destroyer USS Mason (DDG 87) moored to Belfast Harbor for a scheduled port visit on Dec. 15, 2016. US Navy photo. In October Mason was shot at multiple times by anti-ship cruise missiles fired by Iranian-supported Houthi rebels in Yemen. Nitze launched Tomahawk Land Attack Missiles and destroyed three radar sites used in the attacks, but the attacks appeared to continue. An F/A-18E Super Hornet assigned to the Sidewinders of Strike Fighter Squadron (VFA) 86 prepares to launch from the flight deck of the aircraft carrier USS Dwight D. Eisenhower (CVN 69) during the Carrier Air Wing (CVW) 3 fly-off on Dec. 29, 2016. In the background is the guided-missile cruiser USS San Jacinto (CG 56). US Navy photo. 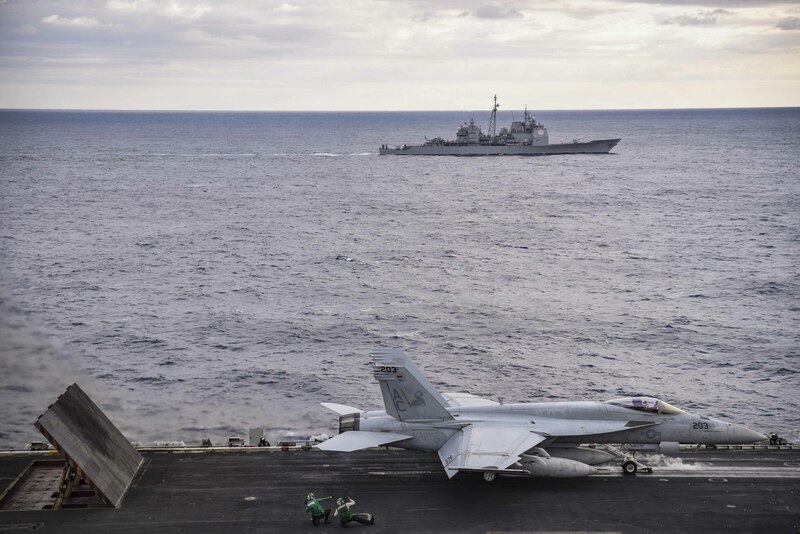 In addition to providing maritime security operations in the U.S. 5th and 6th Fleet areas of responsibility and launching F/A-18s to conduct airstrikes against Islamic State targets in Syria and Iraq, the strike group also supported the July evacuation of personnel from the American embassy in South Sudan. This seven-month deployment was Eisenhower’s first after coming out of a two-year maintenance availability. The ship conducted back-to-back deployments to keep up with operational needs, and a 2013 maintenance availability meant to last 14 months turned into a two-year affair.